I am upgrading a Cambridge R50 crossover. I implemented the 18 dB B139 branch (7mH, 3,5mH, 80uF), wich improves midrange clarity by reducing higher breakup modes from the B139. I implemented the 18 dB well known aB part for the T27, removing the annoying fc ringing around 1200 Hz, and also giving a much less harsh sound, very pleasing indeed. My question: I want to improve the B110A midrange in the same 18 dB-way. 1mH and 30uF in series, then 10uF and 4mH in parallel to earth, then 0,4mH in series (thus forming a 18db lowpass and a 12 dB highpass), then a 7uF+10R zobel to earth, and then (?!) a 5R parallel to 16uF to the B110A. Is there anyone who has experience with this layout? There are two ways of finding out what the crossover filter is doing; measurement and simulation. Apply (1V?) 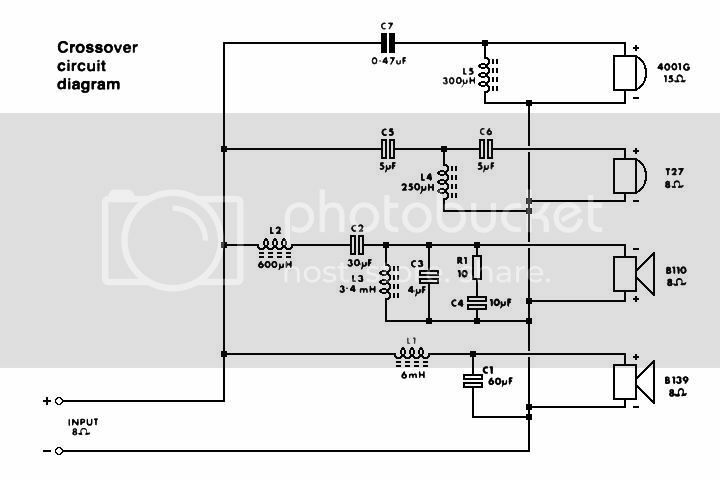 tones to the input of the crossover and measure the voltage across the drive unit. Change the crossover and re-measure. Repeat the process as required. Simulation is quicker and involves no soldering but you will need an accurate measurement of the drive unit impedance in the first place, to use as a load for the simulator. Speakerguru, thank you for the reply. Yes, I have some equipment to my disposal te explore crossover behaviour in the non-digital way. However, I will get then voltage outputs from the filter, probably non-linear, from which I cannot deduce if that leads to a linear acoustic target response. Yes, I have some clue what the mid-response curves have to look like, from KEF Topics and the constructor series leaflets, but that will only be 'about right'. And I want to be shure. Simulation: yes I'd like to try, but only useful if I could find the right component R,L,C(etc)-values of the B110A itself (B110 subtitution diagram). Which simulation program would you advise? The design at hand is probably a KEF lay-out, (Falcon offers an improvement for the DN12 3-wayXO, derived from this crossover). It has strong similarities with the DN19/20 Cantata 18 dB crossover (for B110B and T52), so I think KEF worked this DN19/20 over for the B110A and the T27, and probably came to life in the same era. My question is if someone knows the correct component values in the B110A branch in this XO, probably someone who owns a KEF speaker with the genuine filter (IF it exists?). Is this AusKef/Falcon 53 crossover? Hello Kimmo, Thanks. Yes, this might be it. So I googled and looked on this forum for falcon no 53 and /or Auskef (? ), but could only find threads speaking about it (reinforcing the idea that this is the actual XO), but nowhere the actual layout with component values. Any hints? Has it ever been published? I tried also find more than tales of it, but hit my head in the brick wall. Hopefully someone will see this and will post actual schematic. Still looking, surprisingly sparse considering the vastness of the internet! Webb / R50 great, considering the low number of XO components, but this is what I want to update. I like the relative clarity and simplicity of the design, in an acceptable package. 105: I did a kind-of-rebuild with the CS9 components in a big TL but with the the PL301 rounded-off front, for better dispersion, and tried both 105 (I&II) versions. Very stable performance and stereo image regardless of input power. But under normal listening levels I prefer the crispness of the T27 (the 105-TL was way too big anyhow). So that's what I'm after: a full 18 dB B139 B110 T27 XO. When I built my TLs years ago in the end I settled with 24dB/octave crossovers designed for B139, B110, and Decca London ribbon tweeter. Still being used by a friend after all these years. The monsters are all fully Tri-Amped. More description if you click on the pictures. I learnt a lot building these and also found out how little I knew about loudspeaker design, but I was young and foolish! Never again! I found out the hard way how little I knew about loudspeaker design! And yes, in the end it was worth it.